John Schneider and myself during one of my past Vulkon conventions. 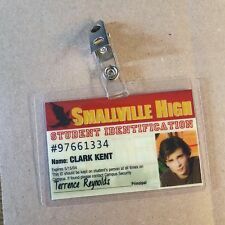 Smallville ID Badge. New never used. 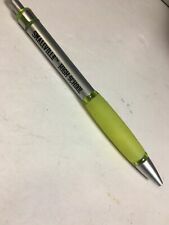 Very cool very nice Warner Bros. Promo item - this SMALLVILLE High School Promotional Pen is a Rare Item made years ago to advertise the Superman Clark Kent "origins" TV Series - silver and Kryptonite green - ballpoint, writes well - barely used! Enthuses Miller. “New allies abound! New enemies afoot! I couldn’t be more excited to help give seasoned viewers and new readers an all-access pass to Clark’s first year in the cape.". The new comic book series picks-up where the show left off (with Clark officially now as Superman!). SUPERMAN SMALLVILLE KRYPTONIAN KEY PROP. MUST HAVE FOR YOUR COLLECTION. Smallville: Red Sun Dark Future! Clark Kent Vs. ZOD: 9th Season DVD Print Ad! This is the actual ad that has been very carefully removed from the original publication. It is not a reproduction, photocopy or reprint. All of my Print Ads are Originals, never a reproduction. All have been carefully removed to keep them in pristine condition. Smallville: Bizarro & Beyond: 7th Season DVD: Print Ad! 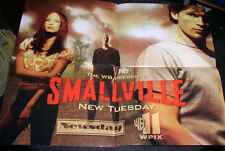 Smallville: Series Premiere: Kents, Tom Welling: Great 2-Page Photo Print Ad! This is the actual ad that has been very carefully removed from the original publication. It is not a reproduction, photocopy or reprint. FREE Trial ! This is a PREMIUM, Center, 2-PAGE ad; TWICE AS BIG as most Print ads! Smallville Movie Poster Print Clark Kent Lois Lang, Lex Luthor 22.5" x 35"
Margot Kidder, Jack O'Halloran and myself at a signing convention in Hollywood Florida. Sadly, Margot Kidder passed away May 13, 2018. Smallville TV Series LuthorCorp Logo Patch Baseball Hat /Cap New. This is a new, never worn hat, available in either blue or black. Accelerate - Calling - Exodus. Season Two: Disc One Suspect - Rush - Prodigal - Fever. Vortex - Heat - Duplicity - Red. Doing that is against U.S. and international laws. Disc Three I watched them all and they work perfectly.See below for the episode titles. This is a new, never used patch, now out of print and sold out from the manufacturer. SMALLVILLE Official Magazine # 29 Direct AQUAMAN Cover Very Fine . Super Rare SOLD OUT "SMALLVILLE: The OFFICIAL MAGAZINE" # 29 (Direct Edition - Nov/Dec 2008)! An absolute MUST HAVE for every SMALLVILLE fan! It had limited distribution and was discontinued in February 2004 and we bought out the entire production run. This is a sealed case lot of 36 new, unused, mint, lunchboxes from our inventory. It had limited distribution and was discontinued in February 2004 and we bought out the entire production run. The new comic book series picks-up where the show left off (with Clark officially now as Superman!). and features other fan-favorite characters from the TV series! This is an 8" x 10" photograph of Phil as John Jones (Jon Jonzz, from Mars) from the hit TV series Smallville. This great picture was personally signed for us at a Convention in Atlanta, GA. in 2008. This is the 2011 twelve month wall calendar for the hit TV series Bones featuring a variety of photo images from the series. Manufacturer: Funko. Up for your consideration is an illusive Charlie Brown Halloween Bobble-head featuring Charlie holding a trick or treat sack. Your patience is appreciated. Condition: New. 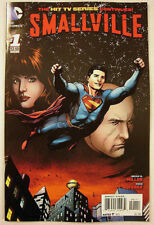 Super Rare SOLD OUT "SMALLVILLE: The OFFICIAL MAGAZINE" # 8 (Direct Edition - May 2005)! An absolute MUST HAVE for every SMALLVILLE fan! ACTION COMICS # 893 Smallville CHLOE SULLIVAN 1st Appearance RARE Sold Out! This comic features the Rare 1ST EVER Comic Book Appearance of CHLOE SULLIVAN from TV's SMALLVILLE! 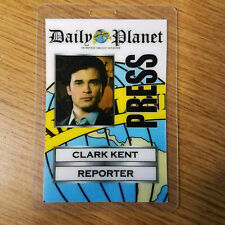 This is an absolute MUST HAVE for every SMALLVILLE or SUPERMAN fan! This is a new, never worn hat, available in either blue or black.
" BEASTMASTER ( INVASION JUNK )". 100% ORIGINAL IN GOOD SHAPE. This is a 4.5" wide embroidered patch, featuring the logo of Smallville High School, from the hit WB TV show Smallville. This is a new, never used patch, now out of print and sold out from the manufacturer.